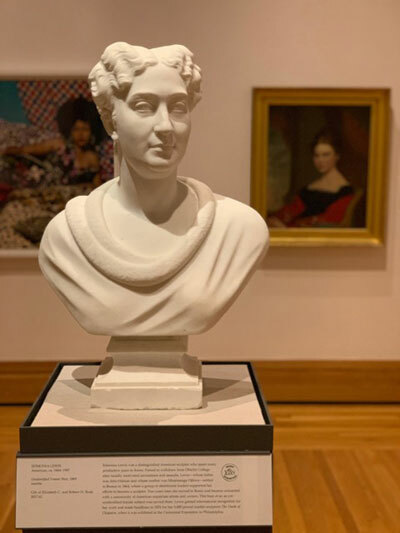 Among Women, a small but selective exhibition of female portraiture from the permanent collection of the Bowdoin College Museum, examines the various ways women are depicted in the visual arts. The thirty images – paintings, photographs, sculptures, and prints – on display until April 7, 2019, span almost two hundred years and offer a variety of styles and perspectives. Curator Eleanor Sepat writes that she intends the exhibition to spark the questions of how far have women come in two hundred years; how has their representation changed; and how does the viewer see himself/herself reflected in these images? Not arranged in any chronological fashion, the works are hung in the Boyd Gallery more for contrast and complementary reasons. A stroll through begins with a collection of characterful contemporary photographs. The first is by African-American artist LaToya Ruby Frazier and depicts four generations of her family at their farmhouse in rural Pennsylvania. The strong chiaroscuro, juxtaposition of a child with her grandmother and other elders, and the casual, even intimate depiction of these women at home in nightdress in a simple kitchen lends the piece a kind of genuine openness. In contrast Sally Mann photographs three generations of the Munger Family by posing all three women frontally in a consciously theatrical way. The third pair of photographs by Damarascotta artist Olive Pierce has the subjects seem almost shy before the camera, with a girl peering out from behind a large bunch of Christmas greenery. The grouping seems to examine the ways the photographer can interact with subjects and become an intermediary between the women depicted and the viewers. A number of large-scale color photographs create a dynamic feeling. 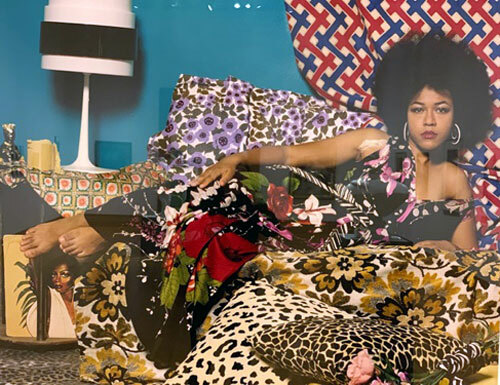 Most striking is Mikalene Thomas’ 2016 Tell Me What You Are Thinking, which depicts an African-American woman reclining on a divan, dressed in exotically patterned fabrics and surrounded by personal objects including a portrait tucked at her feet. The two-dimensional patterning of the clothing takes its cue from Japanese prints, while the pose references Majas from Titian to Manet and Matisse. But it is the sitter’s bold stare at the viewer which adds the modern touch. Mitch Epstein’s Woman Asleep in Back of Car is a very realistic image which raises many questions about the sitter’s context – why she is in the car and where she may be headed - but her closed eyes leave the viewer only an air of mystery. 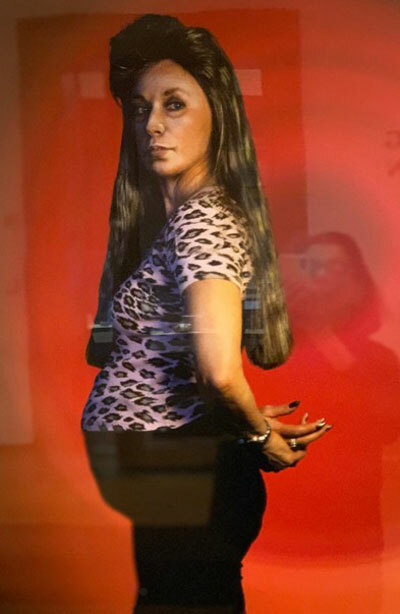 Cindy Sherman’s Self Portrait as a Pregnant Woman is unsparing. The artist superimposes her head on the body of a middle-aged, tackily dressed pregnant woman who confronts the camera unapologetically. There is weariness in her eyes and a resignation that makes the viewer ask how she has come to this condition. Melissa Pimroy’s Emma at the Mirror is a fascinating study of a preteen girl in her bedroom, surrounded by dolls and posters, and other objects that trace her development from childhood to womanhood. She sits pensively studying her own image in the mirror, as if grappling with the momentous feeling of coming of age. Three sculptures attract attention in the gallery. The first by Ann Arnold is a 1958 wooden life size sculpture entitles Standing Female. Painted silver and relatively two dimensional, Arnold’s style pays homage to the 1930s and works by artists like Marguerite Zorach. The other two are marble sculptures in the neo classical style. Most striking is Edmona Lewis’ bust of a woman. Lewis was a woman of color, half African-American, half Native-American, who studied briefly at Oberlin College before withdrawing due to prejudice. She went to Rome, studied at there at the Academy and gained a reputation for her work abroad. The gentle, refined, yet distinctive face of the sitter bespeaks a strong connection between artist and subject. The full-standing figure of Musidora by Bath artist John Adams Jackson has less personal appeal and more allegorical and mythical effect. Also in the neo- classical vein, the highly idealized depiction of the mythical story of a beautiful women spied bathing by Damon, who, from the delicacy of his scruples, does not approach her, but rather leaves a note in praise of her beauty. There are a number of striking oil paintings as well. Two John Sloan canvasses, Window on the Street and White Lace Cap are representative of Sloan’s Ashcan style. The first with its night hues allows the sitter to be the observer of a street life we do not see. 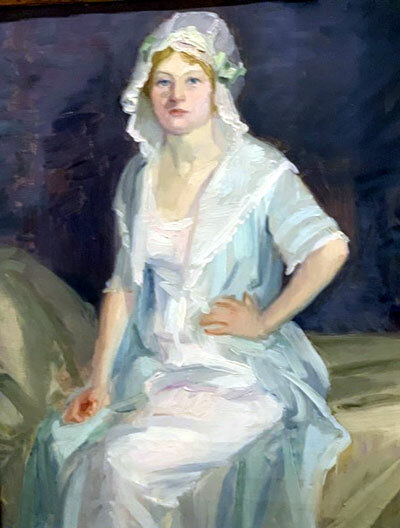 The second plants the sitter directly and frontally and directs her gaze at the viewer. There is an unadorned honesty to both canvasses. More subtle and more intriguing are a trio of realist works that give us the most psychologically probing characterizations in the entire exhibit. 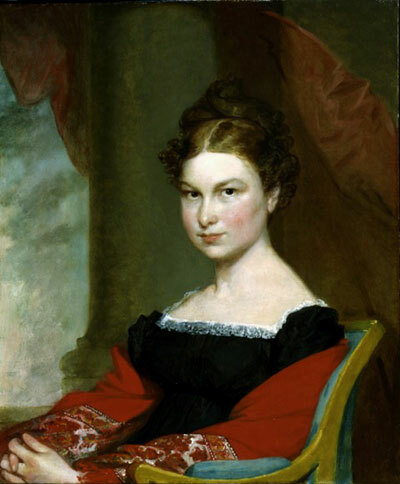 The first is Gilbert Stuart’s 1823 portrait of Phebe Upham. Unlike so many portraits of women of the period, Stuart does not make Mrs. Upham a decorative figure surrounded by fruit and flowers and other symbols of domesticity. Instead, he paints her with careful observation, an enigmatic, but wise expression, and a quiet self-possession that say a great deal about the sitter. Mrs. Upham was, in fact, an extraordinary person, born in Kennebunk, she married a Bowdoin professor and moved to Brunswick, where she became a close friend of Harriet Beecher Stowe and an anti-slavery activist. 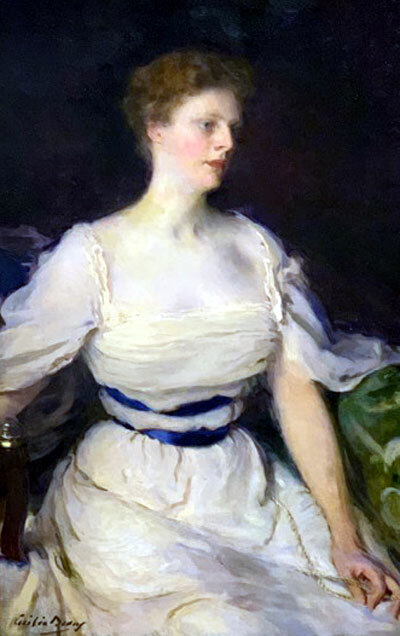 John Singer Sargent endows his 1887 portrait of Elizabeth Nelson with similar enigmatic presence. 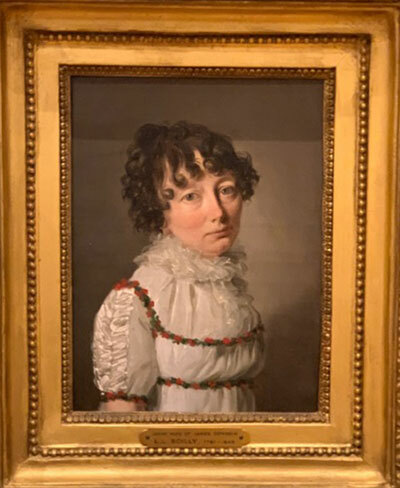 This accomplished woman who was a friend to Walt Whitman, Robert Louis Stevenson, and herself a poet, is depicted gazing into the distance, seemingly lost in thought and contemplation. We cannot know what she is thinking, but there is no question her thoughts bespeak a rich imaginative life. 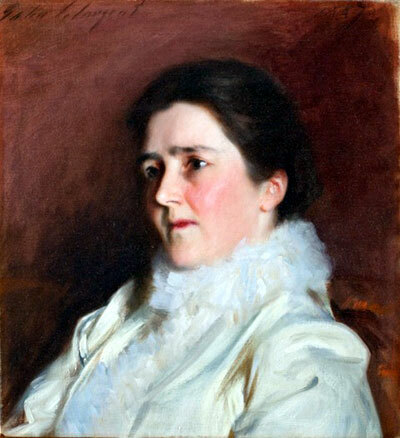 Finally, there is an exquisite portrait of Anna Scott Fisher by Cecilia Beaux, painted in 1896-98. Beaux studied abroad and gained a formidable reputation for herself in late 19th century artistic circles. Her portraits of women were especially prized for their sensitivity and sympathy with the subjects. Mrs. Fisher, like Elizabeth Nelson, also averts her eyes, and seems caught up in a private reverie. In contrast to these complex, psychological studies, several more stylized works make an impression as well. 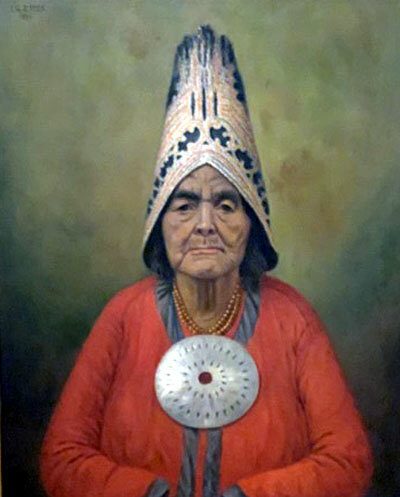 Bangor artist Isabel Graham Eaton’s 1894 portrait of the Penobscot Elder Molly Molasses is a consciously primitive piece, hieratic, two-dimensional, bedecked with tribal symbols. The sitter becomes an icon for the tribe, at the same time that we understand her power through her intense gaze and piercing eyes. Another deliberately two-dimensional canvas is the 1929 Hawaiian Girl by Arman Mankoonian. It shows a dark-skinned woman wearing a floral patterned tunic that mirrors the foliage patterns behind her. The portrait takes its cue from the Fauves and other abstract modernists of the time. Other compelling studies which round out the exhibit are some surprisingly un-exaggerated photographs by Andy Warhol and a lovely small neo-classical image of Sarah Bowdoin by the French painter Louis Leopold Boilly. Because the selection of exhibition works has been carefully made to reflect diversity of subjects and styles, one does not come away with any definitive answers to the curator’s initial queries. One senses a growing honesty in portraiture as time marches forward, fueled in no small measure by the advent of photography.One can trace stylistic changes over the two hundred years, and the way the sitter engages the viewer contributes a great deal to the viewer’s response, which is surely as subjective as the artist’s relationship with the sitter. And, as evidenced in this exhibition with fine female portraits by both men and women artists, this psychological insight has nothing to do with gender at all, but rather with the artist’s sensitivity, perspicacity, and the ability to identify with the subject. If one commonality emerges from the broad spectrum of individuals and artistic styles represented, it is that a truly great portrait is one in which the artist and the model have achieved a tacit intimacy and understanding. What exactly that insight is very often remains a mystery to the viewer. We do not know what thoughts run through Phebe Upham’s mind or what ideas occupy Elizabeth Nelson’s thoughts, but we are drawn in by the sheer power of that inner life. In a truly fine portrait, the viewer becomes part of the creative triangle, entering the world of the subject and the artist, and finding a connection - across time and cultures - to the viewer’s own world and its truths.